Kenneth Womack has plenty of credibility as a Beatles scholar. Having previously authored several books about the band (among them The Beatles Encyclopedia: Everything Fab Four and Long and Winding Roads: The Evolving Artistry of the Beatles), Womack has most recently tackled a subject surprisingly shortchanged over the years. 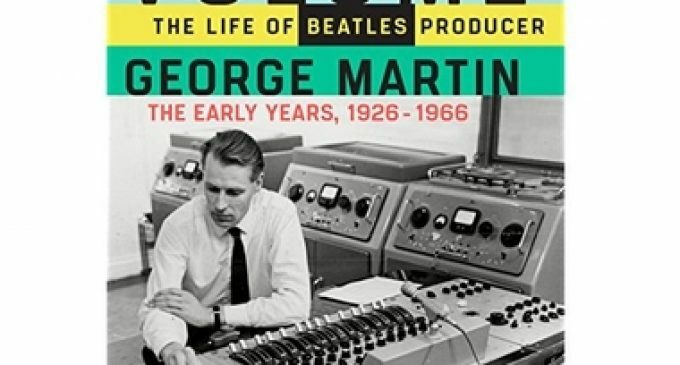 While always covered as part of the Beatles’ overall story arc, record producer extraordinaire George Martin has never been the focus of a an entire biography (excepting his own memoirs). With Maximum Volume that oversight has been corrected.In fact, as the “Early Years 1926-1966” subtitle suggests, Womack’s new Martin biography is the first of a planned two-volume series. 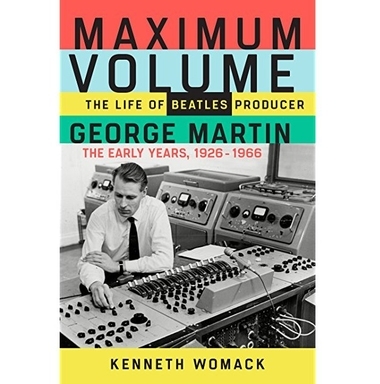 Maximum Volume covers the first 40 years of the music legend’s life, from his inauspicious working-class beginnings clear through to the release of The Beatles’ Rubber Soul, ending in early 1966 as the Beatles are about to embark on the creation of their monumental 1966 landmark Revolver. Much of the book details areas that will be familiar to any serious Beatle fan, but what makes even the more well-worn anecdotes compelling is the greater focus on the technical side.In fact, it actually takes a bit of getting to seeing the name “George” so often in a Beatle-oriented book and remembering who is being referenced (as opposed to Harrison, of course). Womack’s writing style is economical—the book is laced with clear detail (and is also well annotated), but flows album conversationally. The early chapters covering Sir George’s poverty-wracked upbringing are among the most enlightening. Womack paints an astute portrait of a young man with an overwhelming work ethic and an all-possessing drive to overcome his working class status.In many ways, as he raised the stakes for EMI’s niche label Parlophone, Martin broke new ground by rewriting the template for the role of the record producer. Maximum Volume functions as a guide to how he achieved that, from his career beginnings in a era where the producer was known primarily as an “A&R” (artists and repertoire) man. Readers who are not extremely well-versed in Beatles lore will find the accounts of Martin’s contributions to their music particularly revelatory.Hopefully Maximum Volume sells well enough to ensure the eventual release of the second volume. Fascinating as the early-to-mid Beatles years are, it would be a shame if Womack doesn’t get to trace the boldest of Martin’s experiments with the band. There’s also plenty of great work beyond the Beatles that Martin accomplished in the studio that will hopefully be detailed in the second volume (including his recordings with America, Jeff Beck, and a number of Paul McCartney solo albums to name but a few prominent examples). According to Womack’s own bio (on Amazon), the second volume is titled Sound Pictures: The Life of Beatles Producer George Martin (The Later Years 1966-2016) and is due for a 2018 release. But for now, we finally have an in-depth account of Martin as a full-bodied individual—not just as a mentor-figure to the world’s most famous band.